Last week, on a whirlwind trip around Seattle, I visited a few IT trenches and came away with some real-world lessons that I hope are applicable no matter where you live and work. Of course, the Emerald City, home to both Microsoft and Amazon, is a great place to look around. Not only can you smell great coffee in the air; you can smell bits and bytes, too. This is a city that had close to $19 billion in tech-related mergers and acquisitions in the first quarter and $21 billion in the quarter before that. It’s a lively tech community for sure. I visited an old colleague of mine who made the move from New York during the dot.com hysteria of 1999. Upon his arrival he hooked up with another recent immigrant (from California) and together they set up a company specializing in software tools that test security-related products and technologies. Ten years on, they have a sprawling office with about 20 workstations. Many of them were empty on the day I arrived. My friend explained that as his projects ebb and flow he brings in teams of contractors as he needs them, a task he pointed out is pretty easy in these economic times. Contract software developers, many of whom have passed through places like Microsoft along the way, are local and abundant. Would my friend find the same success in Mobile, Minneapolis, or Boulder? Perhaps. But being in Seattle makes it easier for him to hire, and being in Seattle makes it easier for those contractors to get hired. This is the point made over and over again when business magazines generate those annual “top tech cities” lists. 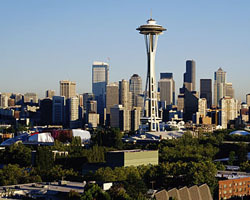 (In Forbe’s most recent list of wired cities, Seattle ranks third, behind Raleigh and Atlanta) Such lists, which blend stats about broadband adoption and the number of WiFi hotspots with info about the number of tech companies and tech workers, suggest that some environments are more conducive to technology growth (and the growth of related jobs) than others. As a proponent of putting everything in the cloud and doing everything virtually (fewer meetings! ), I sometimes forget that the human touch still matters, especially when it comes to networking. After all, if you live in a city where you personally know 30 people in related fields, chances are you’re going to have more success at networking than you will hunched over Facebook or some other social network. Of course, you don’t have to live in Seattle – or Raleigh, or Atlanta, or Cupertino – to find a vibrant tech community. You can find one where you live too. You just have to look for it, dive into it, shake some hands, get yourself known. It may not be as big Seattle’s, but it’s there.